We all have a mobile phone, we all use it more than we’d care to admit. So why wouldn’t you want to market to those users? Mobile advertising offers a platform for engagement, research and comparison. With targeted PPC campaigns, we make sure our clients are appearing where they need to. 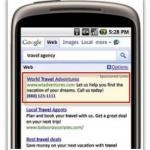 Mobile Advertising – What Is It? Quite simply, Mobile Advertising is the use of platforms such as Google Adwords and YouTube to target users searching via a mobile device, be that a smart phone or a tablet. Google Adwords allows advertisers to target these devices via PPC in essentially the same way that users are targeted via Laptops and Desktop devices. As with other forms of PPC, Mobile Pay Per Click is still based on a cost per click auction model, the fundamental difference though is that above the “fold” only 1 or possibly 2 PPC ads will appear, 3 more paid search placements do exist, however these are right as the bottom of the SERP and will involve users scrolling through a lot of material to find them. As such the top two positions are the key for Mobile Advertisers, with this in mind SGM treat Mobile campaigns completely separately to Laptop and Desktop campaigns. Mobile Advertising – Why Use It? Why bother to integrate a separate mobile strategy into your online marketing plan? Because Mobile Advertising allows you to engage with more users actively searching for you, your products or your services through a cost effective and fully flexible platform. However, if you are already running Pay Per Click campaigns, why not just let your standard PPC pick up any users browsing via a mobile device…? Because by isolating Mobile Devices and breaking them out into separate campaigns with specific Mobile strategies you can vastly improve the performance and ROI of mobile traffic. A recent study by Google, taking information from various online sources has shown us that Mobile Commerce (M-Commerce) is growing… fast, and will continue to grow throughout this decade. As can be seen from the stats outlined users are spending an increasing proportion of their time online via mobile devices, 3G penetration is increasing and the cost of entry, i.e. smart phone contracts, are decreasing. 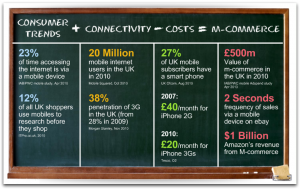 This is essentially resulting in increasing online commerce with around £500m in the UK alone during 2010. With increasing volumes of users using mobile devices to browse and buy online, independent mobile strategies are becoming less of an afterthought and more of a necessity. Mobile marketing is the relationship between any company and a customer using the mobile web. As you may have guessed, mobile is a rather large market. Think about how many people are using a mobile to browse the web, think about how likely they’re going to click away from your website if it isn’t compatible with their screen size and gestures? Mobile optimisation is imperative these days. We will ensure that your site is fully optimised for mobile. Using our specialist knowledge of mobile advertising, Sleeping Giant Media works with clients to develop a campaign optimised specifically for mobile users. This is necessary because mobile devices are not used in the same way as desktop devices, so advertising should be adapted to meet the needs of the constantly connected consumer. Mobile devices are no longer just used for communication but for browsing the internet, social networking and, increasingly, shopping. Mobile sales are escalating so it’s important that businesses harness this potential. Mobile marketing can reach a large demographic. According to Google’s Our Mobile Planet survey, smartphone users are heavy multitaskers, with 80% using their phone while doing other things. Also, 85% of smartphone users look for local information on their phone, and 81% take action as a result. As mobile devices become more widely available and accessible to all these figures can only grow. This offers an unmissable opportunity to connect and engage with these consumers. In addition to optimising your brand’s site for mobile, Sleeping Giant Media can create mobile ads for your brand, specifically targeted at mobile users. We understand the importance of mobile activity and its vital role in conversion path. We can tailor our mobile optimisation to the clients’ goals – whether it’s mobile-specific CTAs, mobile-specific or call-only ads – we will make sure mobile works for, and not against, our client. For more on mobile advertising read our specific pages listed below.